These doodles are done using instruments and techniques I have developed over the past 6 years. Before that, like anyone else, I did a lot of scratching with sticks. 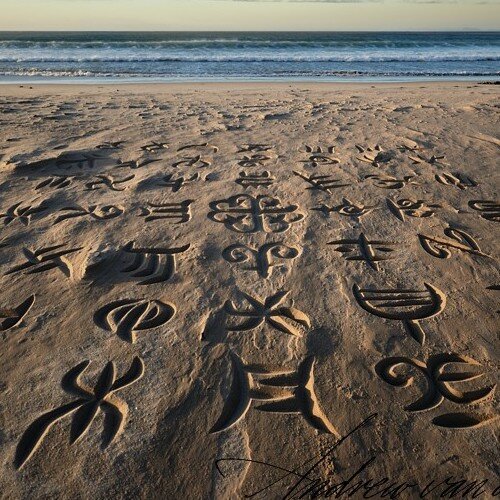 As a calligrapher I have a particular interest in African colonial and pre-colonial writing systems, so when I doodle on the beach its often along these lines. 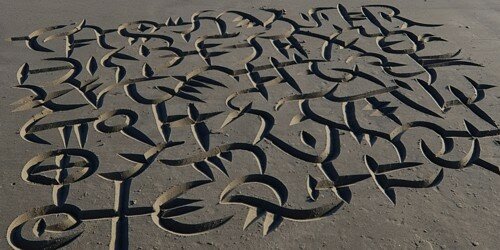 The more angular letter styles take their inspiration from Tifinagh, the script of the Tuareg people of North Africa. It is interesting how that, even to this day, the Tifinagh resembles ancient Greek and Phoenician. The more complex-looking characters in some pieces are usually taken from the Adinkra symbols of the Akan people of Ghana and the Ivory Coast. The last piece was inspired by the structure the characters on Bamana mud cloth. They're mostly meaningless doodles - a play with form - and thanks to Matthew Battles, I now know the word for that: asemic. Look it up - cool stuff. I guess if I had to get serious, I'd use the actual forms and write some interesting text. 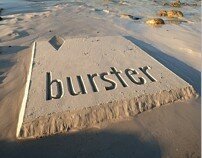 This piece was carved on Zeebrugge beach, Belgium, in July 2008 duringa month-long performance there. 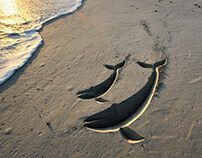 I was trying to create the impressionof an ancient message from the ocean. 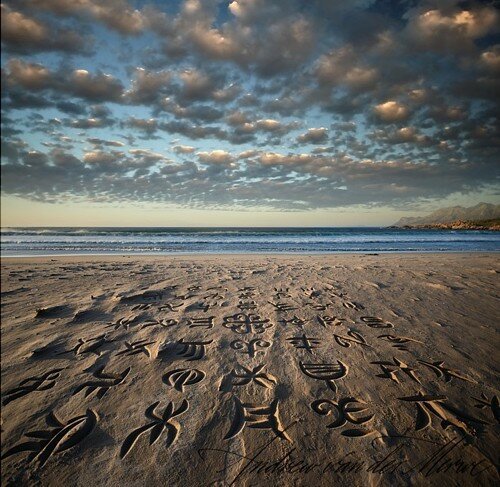 The letters are loosely based onthose of ancient writing systems. In a sense, it is just a doodle. 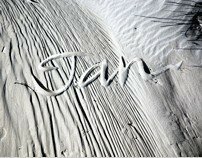 Itwas accepted for the 2009 showcase edition of the Letter Arts Review -the world's premier calligraphy magazine. 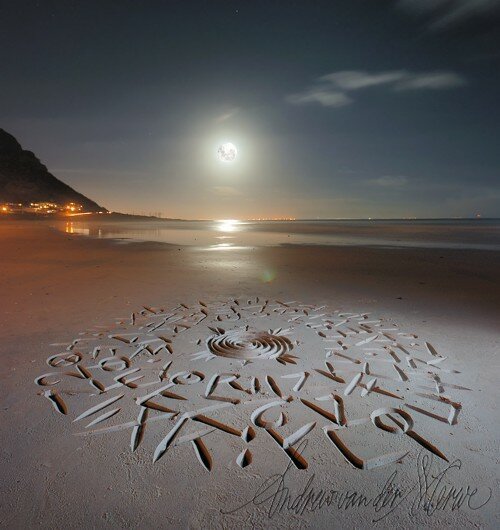 This piece was carved on a beautiful evening on Glencairn Beach onFalse Bay, Cape Town. 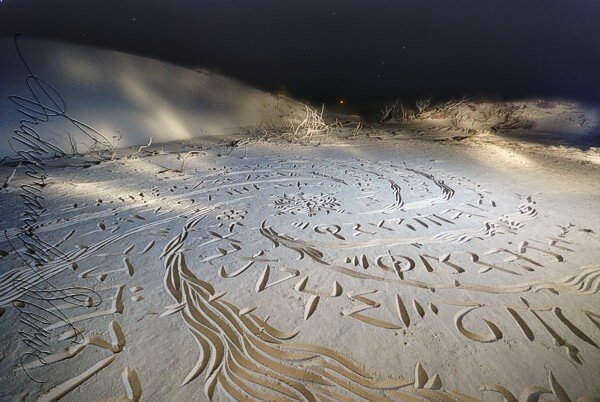 The strange lighting on the letters is given bythe combination of flash and the orange street lights off to the left.The sand was also a different colour 2cm below the surface. The sun went down before I could finish this one. I lit it by walking around with a torch and a flash. The characters in this piece take their inspiration mainly from theAdinkra symbols of the Akan people of Ghana and the Ivory Coast. Thesymbols are neither alphabetic nor pictographic like the Egyptiansymbols, but rather stylised motifs which were used to convey a rangeof things from historical events to attitudes, objects and evenproverbs. I just like the look of them and like to play with them. Iseldom use them in a meaningful way. :-) However, what is meaningfulfor me here is how these symbols convey a sense of the graphic roots ofhuman thought and language so easily forgotten in typical Westernwriting which is much more abstract. For example, the Adinkra symbolfor patience, fondness and care is a wooden hair comb. This is also quite a large piece - about 4.5 x 10m. 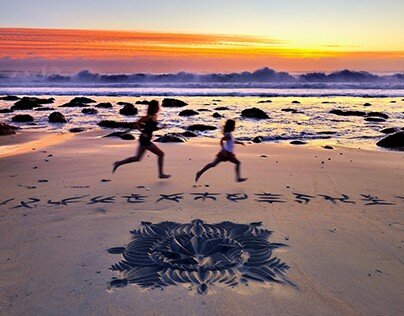 The characters arecarved with my largest instrument and vary in size from 0.5 to 0.75m.Done near Misty Cliffs, Cape Town. 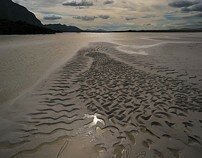 The tide took it before the suncould cast the kind of shadow I prefer. 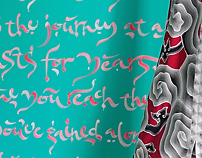 I guess, since this piece says Brugge Plus on the last line, it isn'tentirely asemic. 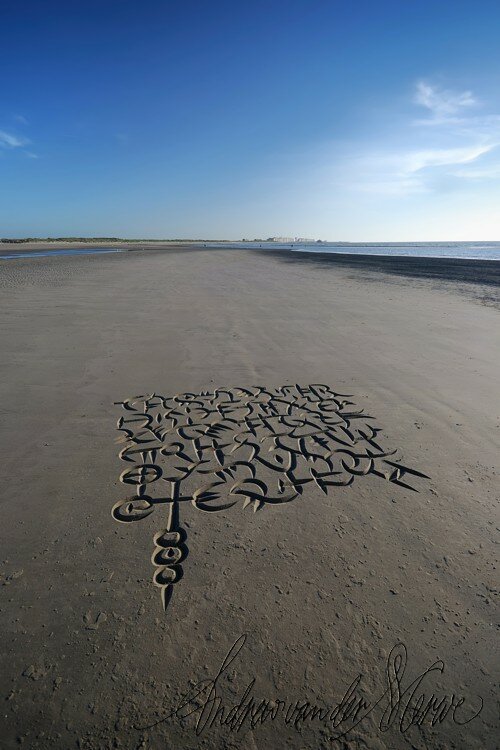 I did it for them around the time they were organisingfor me to go to Bruges for a month-long display on the beach atZeebrugge.Cool thing here was how the water seeped into the letters after I'd cut them.